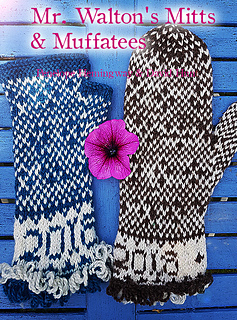 So we came up with Mr Walton’s mitts and muffatees. 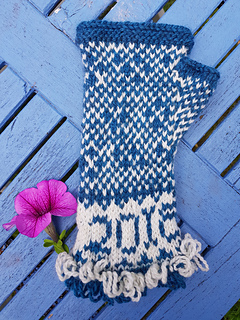 A fast knit, in aran, but using the equisite Dales motifs from the “G Walton 1846” gloves, which are the oldest dated extant Dales gloves. The motif is the old Yorkshire “Midge and Fly” but a more subtle and beautiful variant than can be found on some later Dales gloves. 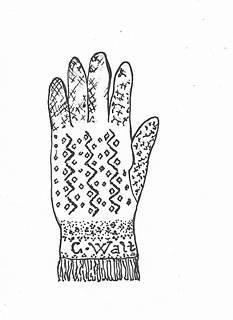 As this pattern is mainly on the original gloves’ palms which are usually out of sight when the gloves are on display. 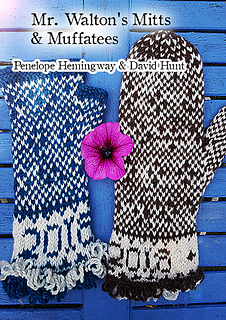 Included in the pattern is a reprise of some of my research on Mr G Walton, and a little on the history of Dales gloves generally. Pattern and charts are included. 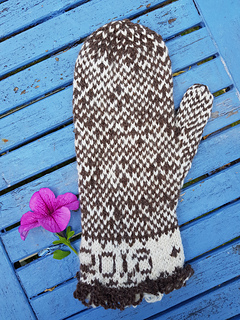 There are charts for the Dales glove alphabet and numerals so you can personalise your Mr Walton’s mitts or muffatees and use in other projects (it is a simple, uncluttered knitted alphabet, designed to fit into a minimal space). They have our trademark thrums and are an ideal small project for handspinners. Some brief notes on spinning for the mitts are included. 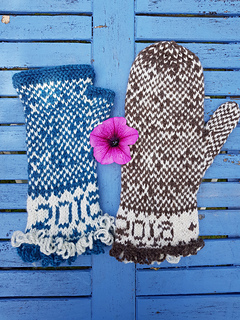 You can knit mitts or muffatees. 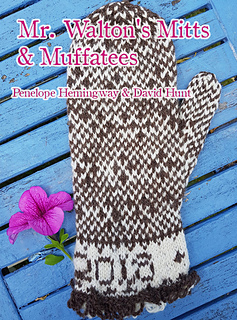 During my research into eighteenth and nineteenth century knitting, I found references to muffatees being knitted and wanted to work out a pattern using the traditional “Midge and Fly”.